I hope that everyone celebrating Thanksgiving this past week had a wonderful time doing so. I can safely say this Thanksgiving ranks high in the "best to date" for us. The food was outstanding. The company was delicious. Oh wait. It should be the other way around...As I told B. that evening after a strong cocktail "we had fun and we had fun making fun". That pretty much sums it up. I live for moments like these. Moments when friends just know that they are going to have a good time, relax and leave their worries behind. When they feel comfortable to dig into the fridge, get out the cutting board and chop away, preparing a delicious meal in a cacophony of pots and pans. I wanted nothing more than great friends around me at the dinner table and I got just that. I'm a very lucky girl. Thank you Tami, Mike, Broderick and Jack for such a rocking day! As far as time with friends goes, I want days like Thursdays everyday. As far as the food goes, Thanksgiving seems to kick start my desire for comfort food. Perfect for slow simmering dishes such as braises or stews. Perfect for a little ravioli making action on a slower holiday weekend. I have been meaning to make gluten free ravioli for so long but always found excuses not to. Truth is, I was concerned the taste would not be right and the dough would be too firm and to dry to hold my filling. That was of course until I tried Shauna's and Danny's recipe for gluten free pasta dough in their just released cookbook. So easy to make that you can have a bowl of fresh linguine on your plate in a little time and with minimum effort. I could have stopped at making simple fresh pasta but one of my favorite vendors at the market, Jason from Meat House always takes care of me with something special. This time it was a nice big lamb beck. I scratched my head for a second, and seeing that he had just derailed my cooking plan for the week, he volunteered preparations and applications. When he said the words "ravioli", my ears stopped listening to any other suggestions. I remembered seeing the picture for Shauna's ravioli and immediately bookmarking it so once home I started the preparation for the dough and the filling. The beauty of ravioli is that you can fill them with just about everything you like. Right now I am tempted to shred some leftover Thanksgiving turkey with a little spinach and ricotta and do another batch. You could even make them completely vegetarian if you wanted. Notes: the combinations of gluten free flours I used differs from Shauna's as I used what was already in my pantry, feel free to substitute also according to your tastebuds and budget. I like to mix the vegetables used to flavor the stock (mirepoix of carrot, celery and onion) for a few reasons: I hate to waste perfectly good food and it's a good way to sneak in more fiber and veggies into my husband's diet but feel free to use straight meat in the filling. I know I don't cut my ravioli the most conventional or easiest way. That's my brain working right there. It does not matter how you get there as long as you get there. It's not labeled on the ravioli as you serve them, how they were cut. The taste is what counts. I did not have a pasta machine to roll the ravioli dough so they were a little thick but still wonderful. Helene, the whole dish looks fab but I'm most impressed with the gluten-free ravioli! Wow what an incredible dish. My husband would marry me all over again for this! those look AMAZING. i can almost smell them. mmm. How gorgeous! I want to slurp that broth right now!! Love this. The use of the slowly braised lamb and this GF pasta dough which looks very appetizing. Wow - AMAZING! can't wait to try! It's chilly here this morning and I think just the photo warmed me up :D These look amazing. Sending hugs. Wow ravioli! That's fabulous! I love them and since months I want to make pasta/ravioli. Thanks for the reminder ;). So wonderful! This dish reminded me of maultaschen ... these meat filled raviolis that the Germans make and place in beef broth! Your recipe has stepped it up by keeping more substance to the meat filling ... kudos! Looks delish! This looks spectacular! 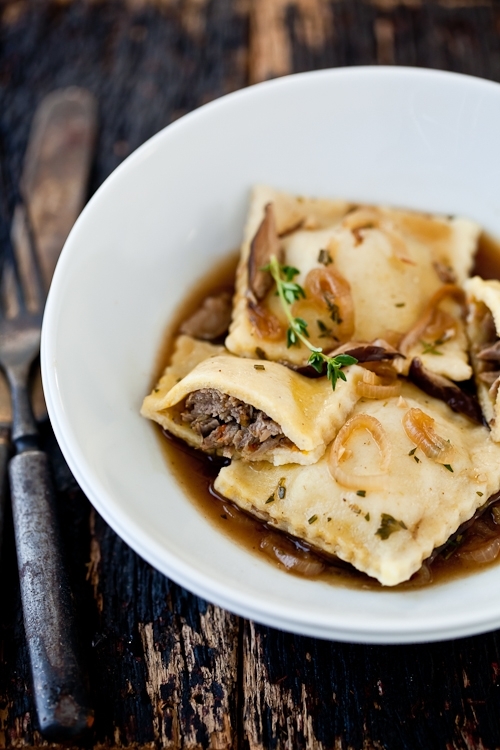 Lamb ravioli - it just couldn't sound any more appetizing! This dish sounds indeed comforting. Gluten free ravioli is a revelation! My mouth is watering! This sounds like such a comforting and delicious dish. And... gluten free. What more could you ask? You have outdone yourself with this recipe, Helene. All I can say is...wow! I saw that recipe on her site forever ago and have been waiting patiently for the cookbooks so I could make the duck version.... guess I've been so busy I didn't realize it was out... thanks. wow, wow, wow! I am so hungry for that! That looks so wonderful! When my partner was diagnosed with celiac disease, I immediately started thinking about all the things we would have to give up. Through food bloggers like you and Shauna Ahern, I've discovered it's not necessarily true giving things up it what it's all about. And more than that, I've also discovered many fantastic recipes. Thanks. I've recently been ordered to follow a gluten-free diet, and while at first I was mortified, I find a recipe like this and I'm ECSTATIC! I will definitely be trying this out really soon. It looks incredible. Gluten free pasta, and handmade - I am so impressed! And such lovely, warming flavors. Can't wait to try this out some cold Sunday. I've got to buy a ravioli cutter. This looks incredible! I am finding out that I need to estimate my cooking time now 50% more than the usual since I started my blog. I don't know if I am not good at time management! Ilke: actually not long if I know what I am aiming for. I plan the shots in my head as I go along. 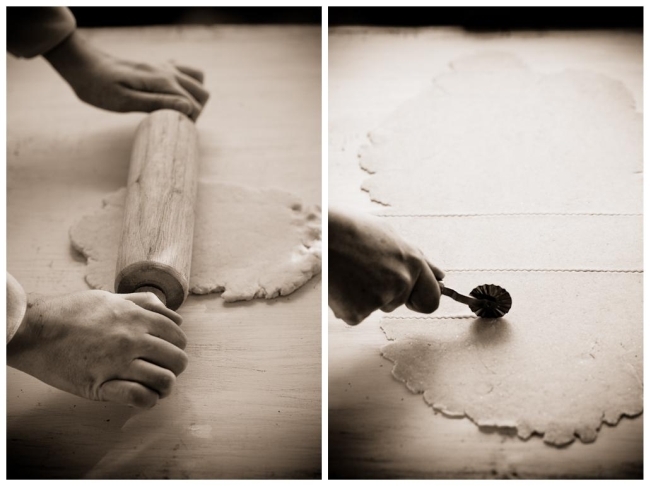 I started the lamb in the morning and made the dough and in the meantime composed the shots in my mind. Once I started the rolling and filling, every shot was taking less than 5 minutes, to adjust my exposure and composition. We actually had to reheat the ravioli since I was done shooting before time. 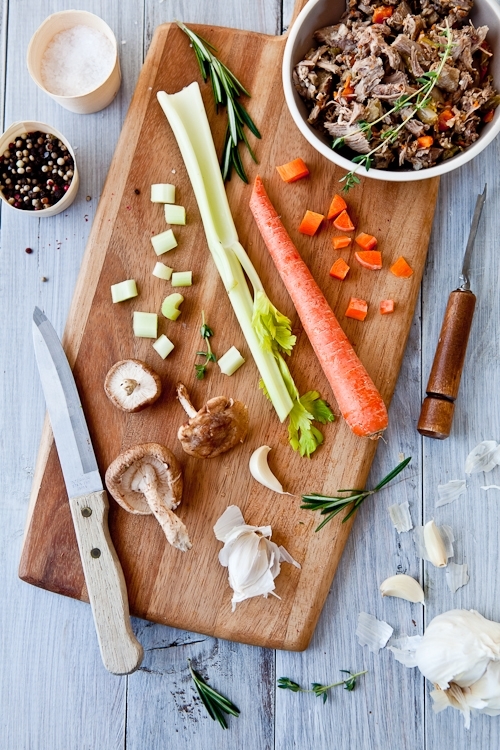 Loving your savory food photographs! So full of great atmosphere and warmth! 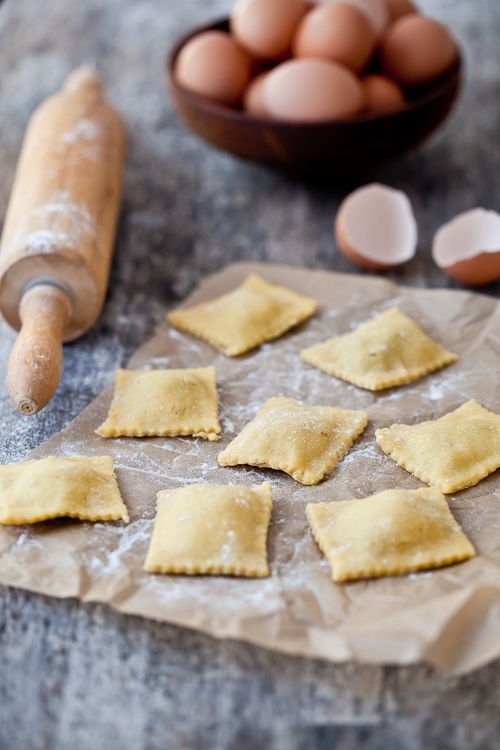 I am particularly interested in your ravioli dough - I will eagerly try to find this combination of gluten free flours at my local markets in order to give this recipe a try. This looks delicious. I haven't made ravioli before but will have to try after seeing this. The photographs are beautiful as well. 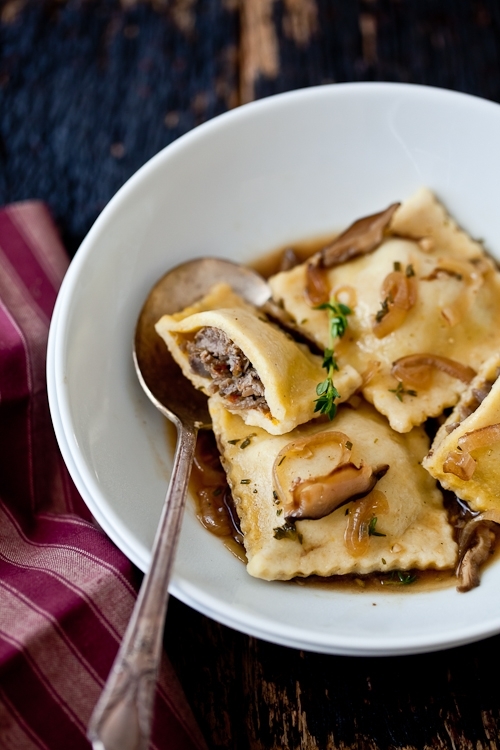 Thanks for this gluten free braised lamb ravioli with shitake parsley broth recipe. It sound wonderful! Your Thanksgiving sounds perfect. I long for more days (or better yet, weekends!) like that too, with good friends and good food. Love this recipe, so comforting. And what a beautiful fork that it. I love when you do a savory dish. I enjoy ravioli and love to make different kinds. I especially like this idea and placing them in broth. My dear, this looks AMAZING. AMAZING. Why do we live so far from each other? Looks so warming and comforting!Perfect for this weather! another I want to try. That looks succulent! What a beautiful array of flavours! I love homemade ravioli... throw in Shiitake mushrooms and you've got me hooked. Your photos are to die for! Miam des bons petits raviolis! I must give this a try. I love shitake mushrooms. I'm glad you had a lovely time with friends and Thanksgiving. What a beautiful dish. I love making pasta at home. This is just the type of pasta I would love with a nicely braised meat filling...delicious! It's been a while since I've visited and I see you have a food photography book coming out! How exciting! Bravo!!! Hello! I can't have the rice flour, do you have any suggestions for a substitute? That's the tricky thing with having to avoid wheat & rice - there aren't a lot of recipes out there that are usable without having to make substitutions. Thank you! Thanks for the gluten-free pasta recipe! I must try that at some point. I haven't been totally happy with commercially-made gluten-free pasta. That lamb braise looks amazing on its own. I could eat the whole pot of it before it even made it into the ravioli! 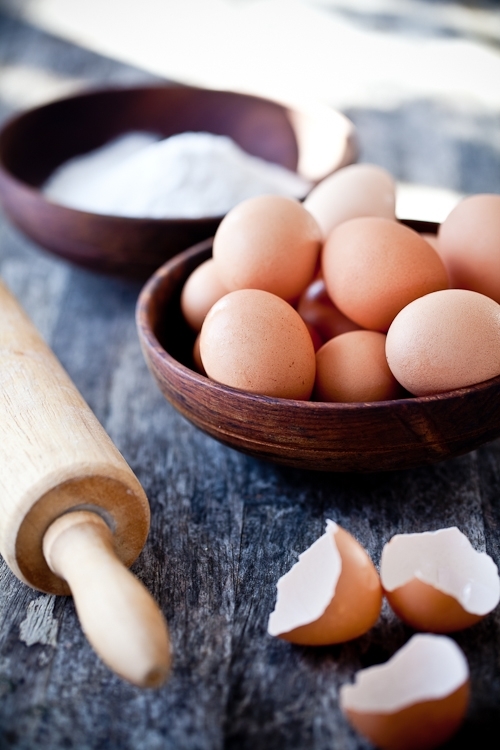 lady_mason: you can replace it with any other flour than rice. I don't even eat meat, but this is making my mouth water. 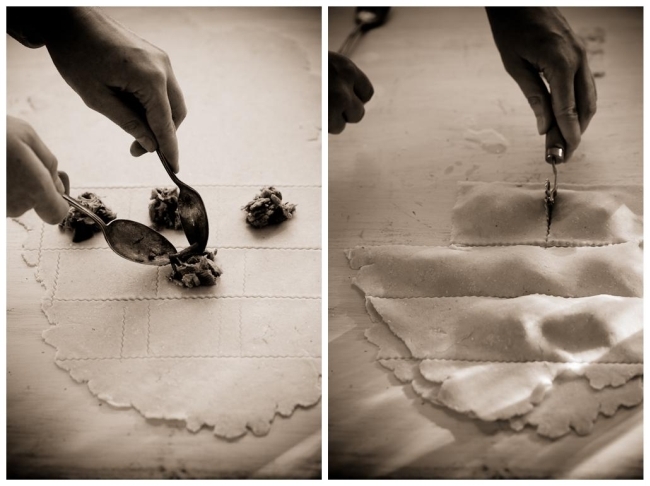 There are few things better than fresh pasta... and a flavorful ravioli is at the top! I made this over the weekend (used regular AP flour though for the ravioli), and it was delicious! Do you buy lamb neck at the farmer's market? I could not find it locally here in Charleston at a grocery store, and used lamb leg instead. Penney: it was a gift from a friend working at the market. You could probably ask Ted Butcherblock if they can get some for you or ask your grocery store. If you are a regular at one, they might go the extra step and get it for you. Legs are a good substitute. Oh my goodness - those look so delicious! Thank you so much for the incredible gluten-free pasta recipe! Definitely the best yet! I filled mine with a pesto-ricotta filling and they were absolutely delicious.